Even in an economy recovering as slowly as this one, corporate gift-giving can still be represented in some significant financial support. In its annual report, the Giving USA Foundation recently revealed that companies and their foundations increased their giving by 12.2 percent to nearly $18.2 billion last year. 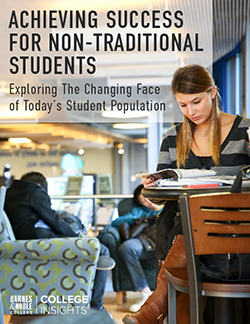 Although corporate giving may come in forms as diverse as charitable donations, scholarships and endowments, at Barnes & Noble College, corporate outreach is represented by a highly personal involvement, where charity really does begin at home. 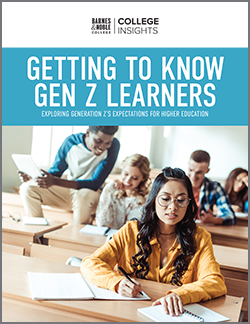 As a major force in education and retailing, the charitable programs Barnes & Noble College supports have a special resonance within the learning industry. From improving fair labor standards in the Dominican Republic through the popular Alta Gracia brand, to forming partnerships with local and national Habitat for Humanity chapters, to support for One Planet Books – a program designed specifically for college stores as a way of recycling or reusing old textbooks to prevent landfill expansion, to donating to the non-profit literacy organization, Reading is Fundamental (RIF), Barnes & Noble College is dedicated to making a difference in the issues that are important to the school partners it serves. But corporate giving can also take on a very personal form. The MS Coast the Coast Bike Ride represents a tough, 170-mile course taken over two days along the Jersey Shore to help raise money to provide programs and services for people with Multiple Sclerosis (MS) and to fund research to eradicate the disease. Contending with winds, bridges and the occasional hill, it’s not for the faint of heart, but for Barnes & Noble Colleges’ Information Security Officer, Rob Reiser, it’s a challenge he enjoys. 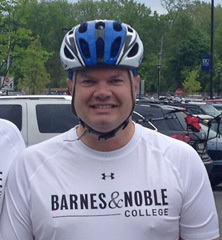 Reiser, who rides with his brother and friends, has participated in the ride for the past 21 years, but this past May he invited along a team from the Barnes & Noble College home office. Consisting of Barry Brover, Steve Culver, Lynn Petersen, Jose Acta, Mike Frantino, Laura Serrano, Kari Painter, Lana Samsanova and Jason Snagusky, the team outperformed itself, raising over $2,000 for the National Multiple Sclerosis Society – New Jersey Metro Chapter. “It was a nice ride,” Reiser recalls, “despite starting out in the rain and with some wind, but we all did very well,” he adds proudly. Barnes & Noble College Information Security Officer Rob Reiser. Although he admits he knew little about MS before the ride, Reiser says his involvement has increased his knowledge about the disease. “On the second day of the ride, the organizers talked about how much the ride helps those afflicted with MS and how it acts as an important support system for those with the disease and for their families,” he says. 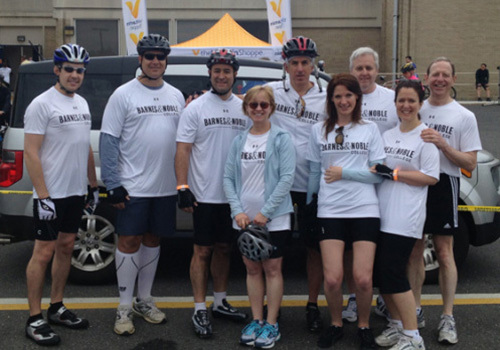 For Lana Samsanova, Senior Treasury Analyst for Barnes & Noble College, the event was a chance to expand her love of biking and to help others with the disease. “I like biking, in general,” she says. “So, I thought this would be a good opportunity to participate in something meaningful. I know someone with MS, so it was quite emotional at the end when we crossed the finish line. To see all the people cheering you on – it had quite an impact.” Indeed, the event had such an effect on Samsanova that she is already planning to participate in next year’s ride. “I’ve been telling everyone I know to ride with us next year,” she adds. For Reiser and others, the ride had an impact in other ways as this year, just six months after the superstorm that ravaged the northeast, the bike route took riders past many scenes of devastation caused by Hurricane Sandy, reminding everyone of the importance of giving. Involvement in charitable programs is more than just corporate responsibility, it also represents a deeper belief in the importance of making a difference in the communities it serves. It also shows that through the actions of both companies and individuals, a little bit of giving can go a long way.